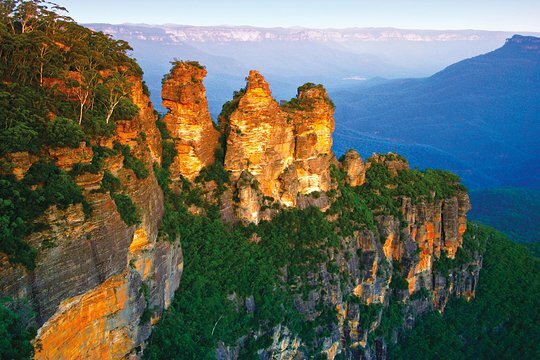 The must-see sights surrounding the Blue Mountains, a UNESCO World Heritage Site, are dazzling yet dispersed—unless you rent a car, you’re unlikely to pack it all into one day. See more sights in less time on a day tour from Sydney, which includes stops in Leura and a wildlife park. Plus, you can upgrade to include lunch and tickets to Scenic World for a seamless, budget-friendly experience. Your day trip begins with pickup from your Sydney hotel, where you board an air-conditioned bus and travel across the iconic Sydney Harbour Bridge. 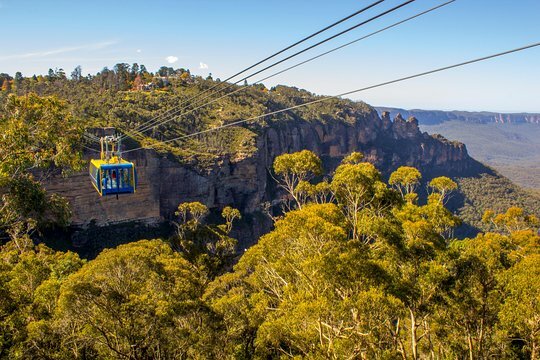 Marvel as the ancient plateaus of the Blue Mountains come into view and, if you’ve upgraded to include an admission ticket to Scenic World, ride the world’s steepest aerial railway, take a cable car ride, and wander across the skywalk. Continue to the mountain town of Leura to browse the shops and eat lunch, if you opted for it when booking. The next stop is a wildlife park, where you observe native Australian animals such as koalas, kangaroos, echidnas, and crocodiles. Your tour concludes with drop-off back in Sydney. • Scenic Skyway - Australia's only horizontal passenger-carrying cable car. It's a 7-minute ride 656 feet (200 meters) above the Jamison Valley, where you can appreciate superb views of the Three Sisters, Katoomba Falls, Mt. Solitary, and Orphan Rock. The Skyway operates every 10 minutes. • Scenic Railway - This is the world's steepest incline railway. Travel through a cliffside tunnel and ancient rain forest as the railway descends 1,361 feet (415 meters) down the escarpment at a gradient of 52 degrees. The railway takes you to the rain forest boardwalk connecting to the Sceniscender platform and operates every 10 minutes. • Scenic Cableway - The steepest aerial cable car in Australia will take you on a 1788-feet (545-meter) ride into the World Heritage-listed rain forest of the Jamison Valley. The Scenic Cableway is completely wheelchair accessible. This was an amazing tour.